ruthdelacruz | Travel and Lifestyle Blog : My Elba Kitchen Cookbook: Newbie Chef's Kitchen Bible Launched! My Elba Kitchen Cookbook: Newbie Chef's Kitchen Bible Launched! Elba is not a new name for me. My mom (and dad) has chosen the brand when I requested for an oven when I fell inloved in baking during College years. That was 10 years ago. The sleek black Elba oven is still serving us after so many years of good food from mom, brittle chocolate chip cookies, failed chocolate cakes and burnt hotdogs. Elba is an Italian Brand and has been a kitchen name for 20 years in the Philippines. Now Elba has cooked a new innovation and it is not just good dish, or a tested recipe, but a collection of finest dishes crafted by popular chefs with amazing chefs from the Center for Culinary Arts (CCA) - the My Elba Kitchen Cookbook. I was lucky to be invited to the launching of this new cookbook in the Grove, Rockwell last week. The event was attended by media practitioners, bloggers and foodies who were all excited about good food and good recipes. Chef Darin Epp impressed the crowd with his fun style in the kitchen and few Tagalog words. Chef Richie Custodio, although young and masculine, knows his ways in the kitchen. He did 5 interesting dishes from the My Elba Kitchen Cookbook. making cooking easier for housewives and frustrated chefs. The cookbook also features recipes which use pastas for dessert. The CCA and Elba Team with Chef Sau Del Rosario. He didn't do a cooking demo, but his presence made everyone's day despite the rainy weather. 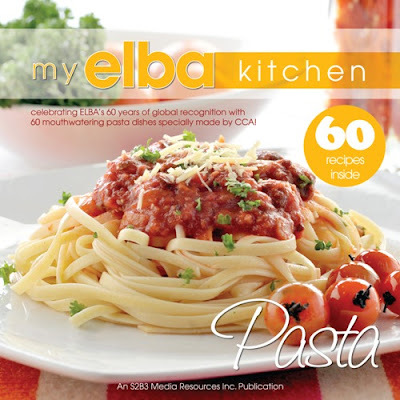 The My Elba Kitchen Cookbook is now available in bookstores for only Php399. Bring home the best recipes, wear your apron and do magic in the kitchen. © ruthdelacruz | Travel and Lifestyle Blog : My Elba Kitchen Cookbook: Newbie Chef's Kitchen Bible Launched!